Summary: should you use the Scribbr Plagiarism Checker? Pricing: is it worth it? Committing plagiarism is the act of using someone else’s words or ideas without crediting the original author(s). It has serious consequences such as failing a course or being expelled. Therefore, it is important to fully understand plagiarism and learn how to avoid it. Plagiarism checkers can help you with this, but unfortunately not all plagiarism checkers are safe and accurate. In this article we review the popular Scribbr Plagiarism Checker. Yes, after reviewing the Scribbr Plagiarism Checker we can definitely recommend it. Although it’s not free, it offers great value for money. Especially students writing an important research paper or thesis should make use of this plagiarism checker. It’s not possible to add a citation directly in the report. In addition to the plagiarism report, Scribbr provides resources such as a plagiarism guide explaining the report and a Knowledge Base with articles about plagiarism and citing sources. This way you don’t just check for plagiarism, but also learn to prevent it in the future. The plagiarism report focuses on the preview of your paper. Every sentence that is flagged as potential plagiarism is highlighted and numbered. The color and number correspond to a specific source. This makes the report clear and easy to scroll through. Another thing that stands out is the lack of ‘false positives’. Common words and phrases are not flagged as potential plagiarism. Therefore, you feel less overwhelmed by the number of similarities, leaving time for you to focus on the important similarities. The plagiarism percentage, shown in the top right corner, indicates what percentage of your document is similar to other sources. It is important to note that this is not necessarily all plagiarism. Similarities that are correctly cited and quoted are also included in this percentage. Unfortunately, this is something that all plagiarism checkers do, because the software is not able to verify the accuracy of the citation. It is up to you to determine if a similarity is correctly cited or if it constitutes plagiarism. The list of matched sources is an impressive feature of the Scribbr Plagiarism Checker. When clicking on the source you get to see a snippet of the original text which you can use to determine if your text is indeed the same or similar. If the text is indeed similar, you immediately know which source to cite. Most other plagiarism checkers simply link to a google results page where you need to find the source and passage yourself. Unfortunately, it is not possible to cite the source directly in the plagiarism report. Based on our experience, we can conclude that the Scribbr Plagiarism Checker detects more plagiarism than any other check on the market. This is due to the Turnitin powered algorithm and the size of the content database your document is compared with. 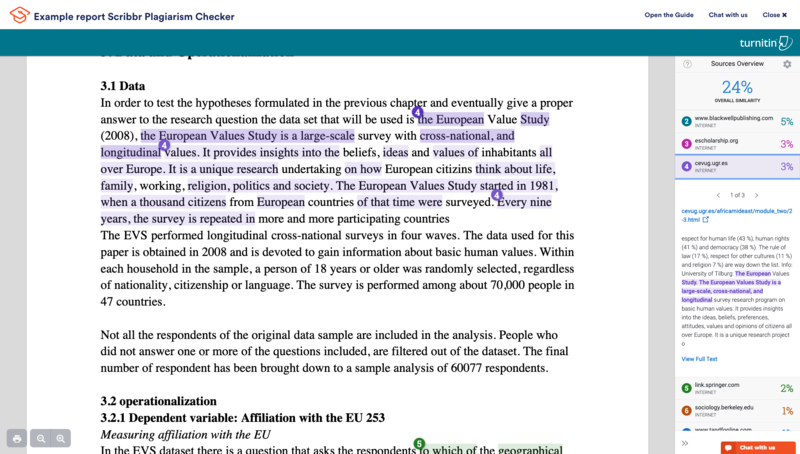 The Scribbr Plagiarism Checker uses the plagiarism detection software of Turnitin. Turnitin is the authority when it comes to plagiarism detection and until recently, its software was only available to universities and other educational institutions. As far as we know, Scribbr is the only company offering a turnitin plagiarism checker to students. The advanced plagiarism detection algorithm detects both quoted and paraphrased text. Simply changing a few words in a sentence won’t help. This makes the Scribbr Plagiarism Checker really stand out. The Scribbr Plagiarism Checker compares documents with over 60 million internet sources and over 30 million scientific articles and books. The content database is provided by Turnitin. Most other plagiarism checkers have a much smaller database which contains only internet sources. This makes the Scribbr Plagiarism Checker especially interesting for students and academics who often consult and cite scientific articles. In contrast to other plagiarism checkers, Scribbr doesn’t add uploaded documents to their database. So you don’t have to worry about having an exact match with your own document when your professor decides to check for plagiarism. In addition, Scribbr allows you to delete your document from the Scribbr server with the click of a button. The fact that they have this feature proves they take the safety of uploaded documents very serious. The price of the Scribbr Plagiarism Checker depends on the size of your document. Checking a small essay is cheaper than checking a full dissertation. The Scribbr Plagiarism Checker can be purchased with a 15% discount if bought in combination with Scribbr’s proofreading and editing service. Prices are higher than most other plagiarism checkers, but in return you do get a professional plagiarism report and the peace of mind that all similarities in your paper will be detected. That’s better than spending $10 on a plagiarism checker that doesn’t detect everything.